Lying almost on the equator, Singapore is located at the southern tip of the Malay Peninsula. Consisting of 63 islands, including the main island itself, Singapore is the smallest country in Southeast Asia. However, what it lacks for in size it certainly makes up for in charm. 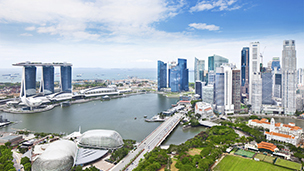 As a thriving city-state, and heart of business in Asia, Singapore is a carefully managed combination of Western modernity and treasured Eastern and colonial past that makes for captivating sightseeing. With its sleek skyscrapers, the latest fashion trends and all the entertainment Orchard Road has to offer, Singapore’s downtown district might be an image of hi-tech wizardry but within the city you can still recapture earlier eras. In the busy streets of Chinatown, fortune tellers, calligraphers and temple worshippers are still a part of everyday life. In Little India, you can buy the best sari material, freshly ground spices or a picture of your favourite Hindu god. In the small shops of Arab Street, the cry of the imam can be heard from the nearby Sultan Mosque. From lush botanical gardens, a world-class zoo, historic national museums, modern art galleries, temples, riverside dining, and boutique shopping precincts – Singapore offers a unique holiday experience.